What To Do About the Aliens? Last night, we snuggled on the sofa with Steve snoring in the corner and watched the Discovery Channel just in time to hear Stephen Hawking's advice about dealing with an eventual encounter with aliens. I explained to Jonah who Hawking was and why he has that robotic voice. I'm quite sure that Jonah thought that Hawking was an alien; he wasn't buying my story that Hawking was a really smart guy. Hawking said that there is no doubt that life exists on other planets. The aliens would probably be a lot like us and that we should keep our distance. Candy for bloggers. Aliens are better than zombies. So, the blogosphere weighs in. Dan Drezner applies lessons from international relations to this new threat. Glenn Reynolds. Rob Farley. Hawking just wants to be governor of Arizona. Really, though, it’s Terry Bisson for the win. I give you “Made of Meat“. Getting enough energy density onto a ship to take it across interstellar space is really daunting. I’m kind of surprised to see Hawking even taking the idea seriously. It probably takes couple-three hundred years to get here, it’s really hard to get enough information about a solar system fifteen-thirty light years away to see that it would have habitable planets. I think we are stuck here, and alien races are stuck there. If they worked hard at it, maybe they could send us movies and music – if those were things they even did. Same with us. But, bug eyed monsters coming out of flying saucers and stealing some babe out of the arms of her failed defender? Not likely. Same here. I thought: if other beings figured out how to travel at faster than the speed of light, or live long enough to get here at all, they would probably have mastered some kind of molecular, even atomic, manufacturing process. So they could make anything, and would be doubtful they would travel 30,000 years to get our “resources”. But I might be missing something obvious, since I know nothing of the subject. 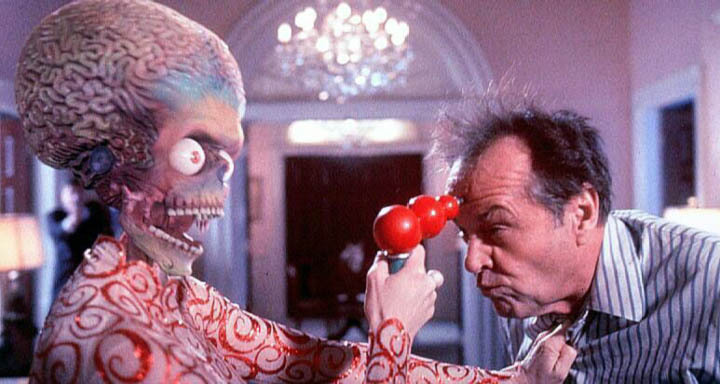 Various people without real jobs and the makers of the under-appreciated comedy Evolution postulate that the aliens would arrive in a very low-mass package that used local resources to reproduce themselves once they get to another planet. You’d get aliens without aliens having had to make the trip. MH, that’s one of the conceits of Charles Stross’ Accelerando, and to a lesser extent his Singularity Sky. Although in one of them humans (or post-humans) are the aliens in the low-mass packages. I’m sure there’s much more in recent SF, but I don’t get enough of it Over Here. “Low-mass package” – it’s a sort of interesting notion. And leads, inevitably, to thinking about farts. Gas is from failure to digest some of your foods – beans have, for example, small polysaccharides which we don’t digest, there are some things in onions we don’t do well with. And that’s us, with food we evolved eating! (well, beans only since we learned to cook, which is likely why we can’t digest small polycsaccharides). For this package of alien seed to grow here, it would need to be able to use local resources – we need amino acids in our food, from protein, they are stereospecific and we need the particular stereospecificity. The alien packages would need to be able to eat local meat (us, in the stories!) or to grow it all from sunlight while surrounded by local flora and fauna. It’s a nice premise for a story, but seems unlikely. It’s a nice premise for a story, but seems unlikely. Especially the part where David Duchovny and Julianne Moore are using a fire hose to blast dandruff shampoo into the alien’s sphincter in an effort to save the earth.